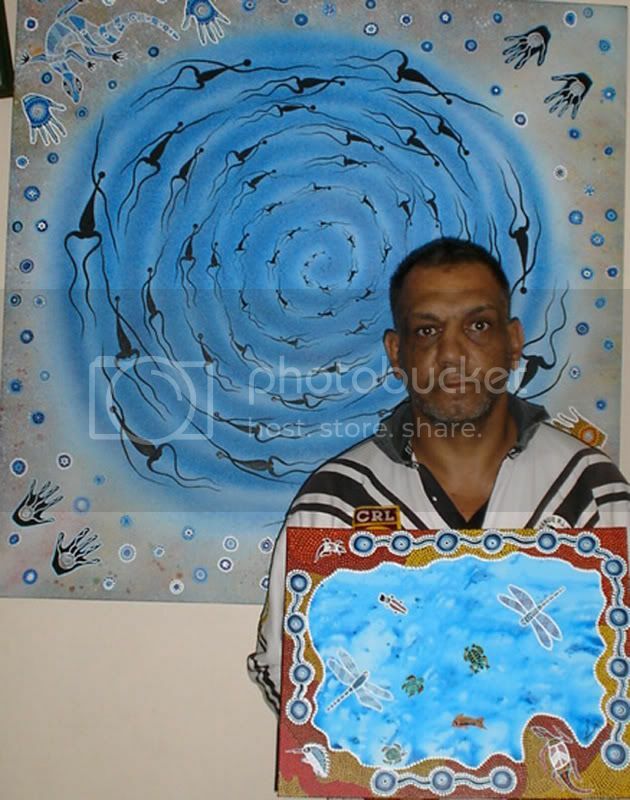 This paintings depicts a Billabong and the life under the water. The three circles joined by squiggly lines represent my signature and the three rivers of the "Wiradjuri Nation", The Wambool (Macquarie),Kalar (Lachlan) and Murrumbidgerie (Murrumbidgee).The Wiradjuri tribe is also known by the name of "the River people" as we all lived along the banks of the Rivers which stretches across NSW. The Wiradjuri lands stretch from Nyngan to Albury and from Hay to Bathurst - the largest territory in New South Wales. Our country extends across 80, 00 square kilometers across areas known as the South West slopes, central and Southern table lands, Capital Country and the Riverina. Billabong Dreaming is the painting Im holding.